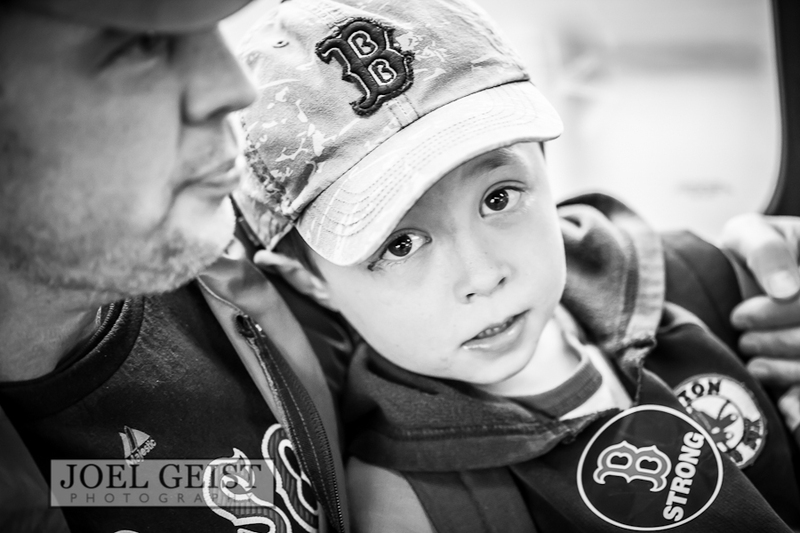 This week has been hard for the Boston area. First off my heart and thoughts go out to all the People injured and the families of those who were lost in this tragedy and law enforcement who worked so hard and gave so much to apprehend the suspects. I am not going to go through details that you have already heard what I am going to attempt to do is show you how the city is trying to get back to some state of “normal” although it is clear to see it will not be forgotten. 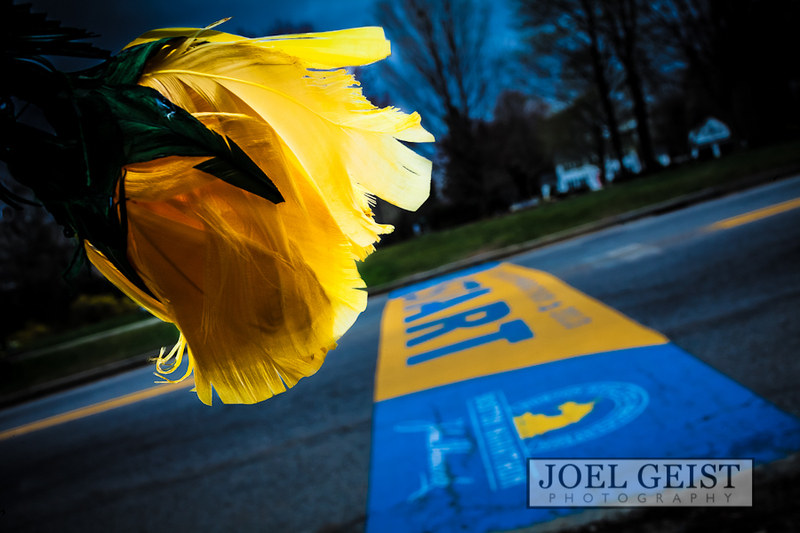 My story starts at the starting line in Hopkinton Massachusetts where this feather flower was placed along with others along the road. 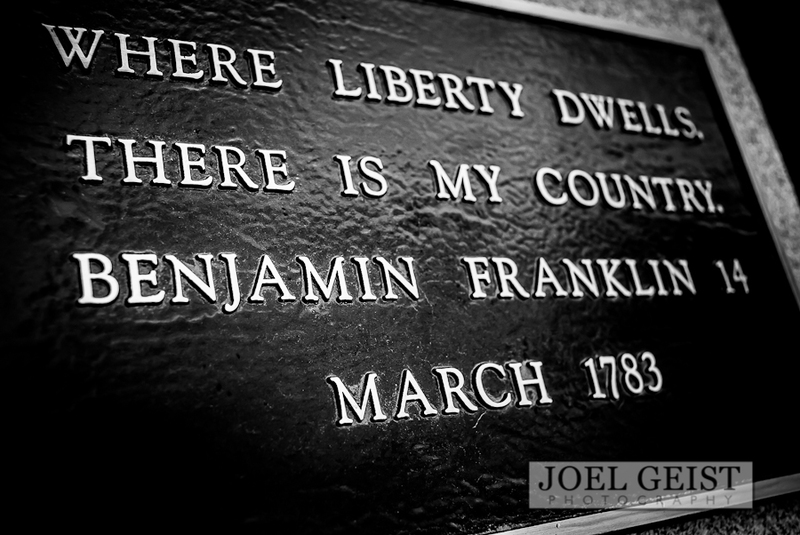 As I started to shoot I happened upon this quote from Benjamin Franklin along the starting line and I got to thinking about the history of Boston and how I didn’t really feel like I was a part of it, as the adjustment to the area has been slow. I took it upon myself to try to tell this story as I see it and I had hoped I somehow would come out feeling more a part of it. While the days events of Friday unfolded everyone was told to stay inside and the city was basically shutdown to insure the safety of the public. There was an all clear put out and people ventured out. Then shortly after a David Hennebury tipped off the police, sirens and gunfire rang out through Watertown Massachusetts. It had not dawned on me the impact this would have on the public until the next day. 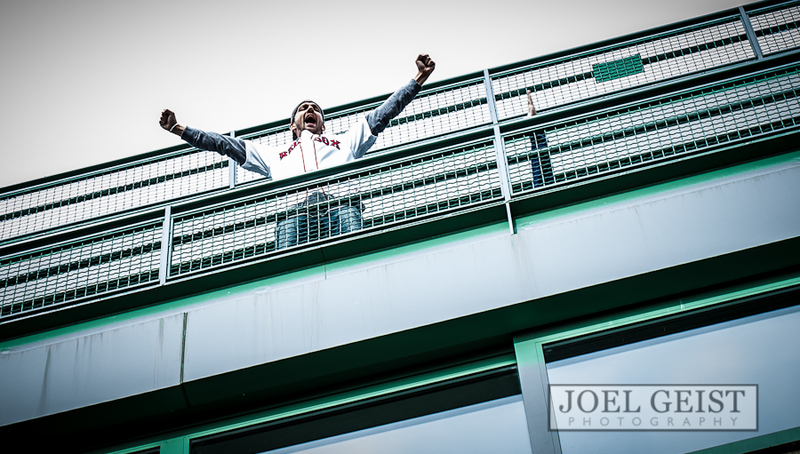 I hit the T in the morning to go into Boston to do my photography walk, the subway was packed full with Fenway traffic. 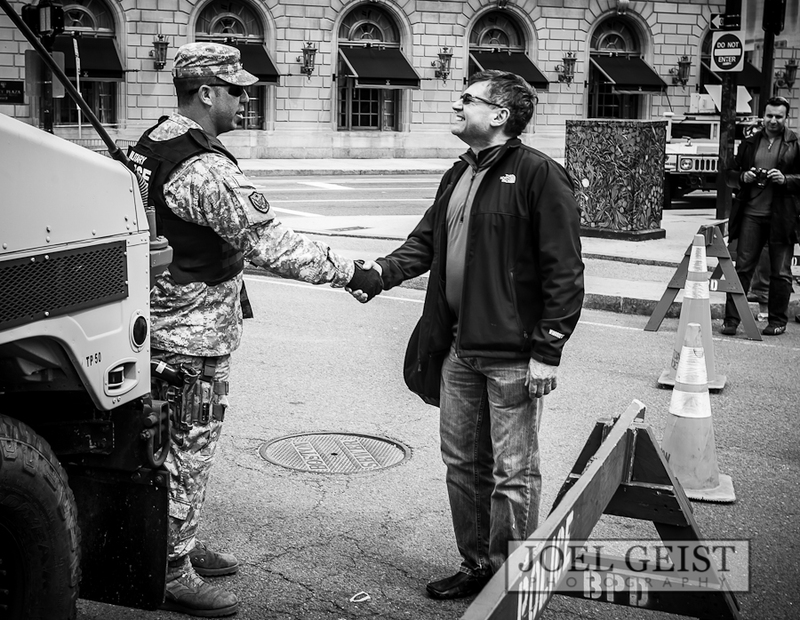 The Copley station was closed due to the proximity to the blasts and there were armed guards in the station. Unfortunately I was not prepared for that as my camera was still in my bag. I got off the subway and headed to the memorial sites. This last photograph I felt was very powerful. 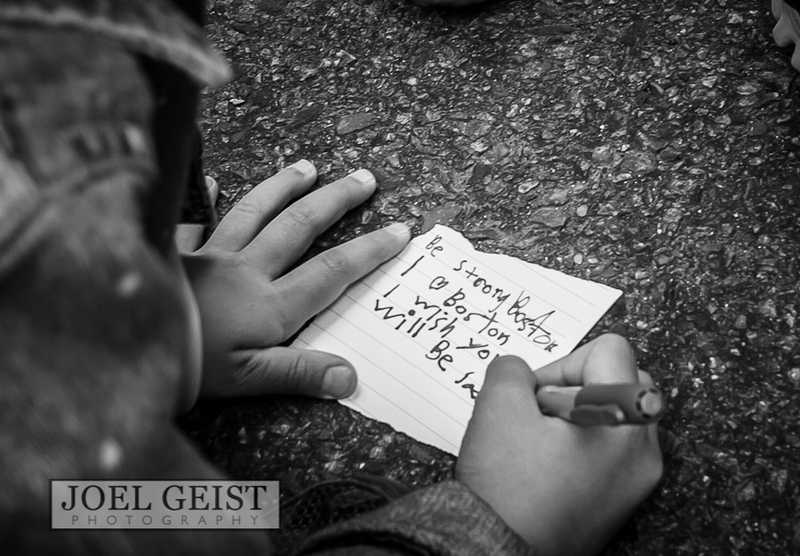 This little girl was writing a message on her own, to put up with the rest of the messages on the memorial. When schools are closed and parents have to explain why, the level of fear this could impart to our children of the future is scary to think about. 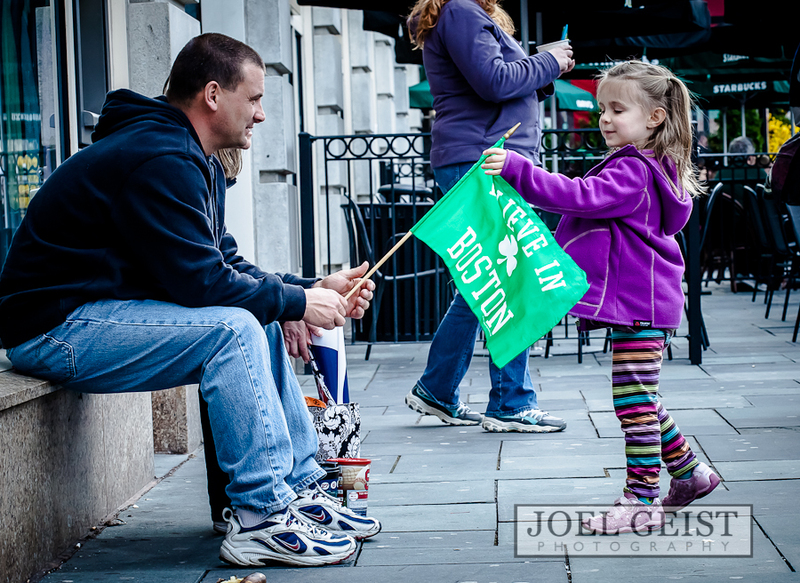 Yet this little girl is telling us to stay strong, and the she hopes Boston will be safe. I saw everyone holding there children a little tighter and snap to attention when there was a siren as if on high alert. 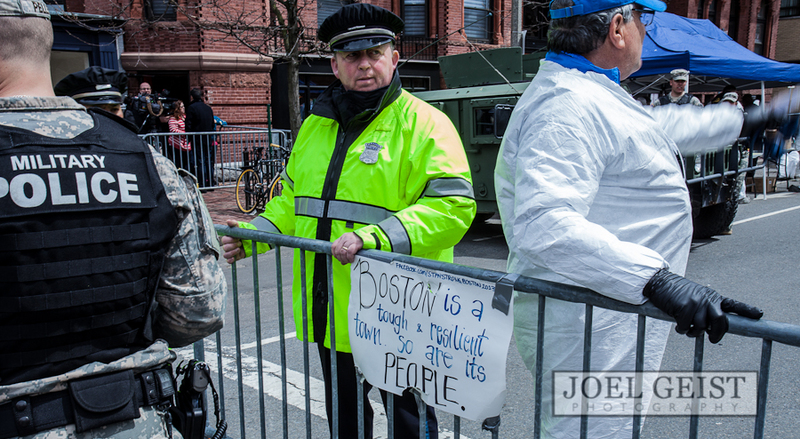 It may take some time for people to get over some of that anxiety when they hear a siren, but Boston is not the city to give into terror and stay in their homes. 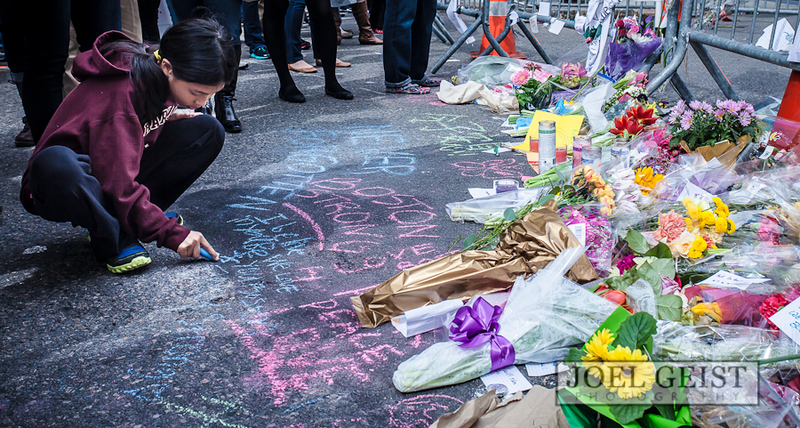 I started searching for ways that people were trying to move on from this tragedy. 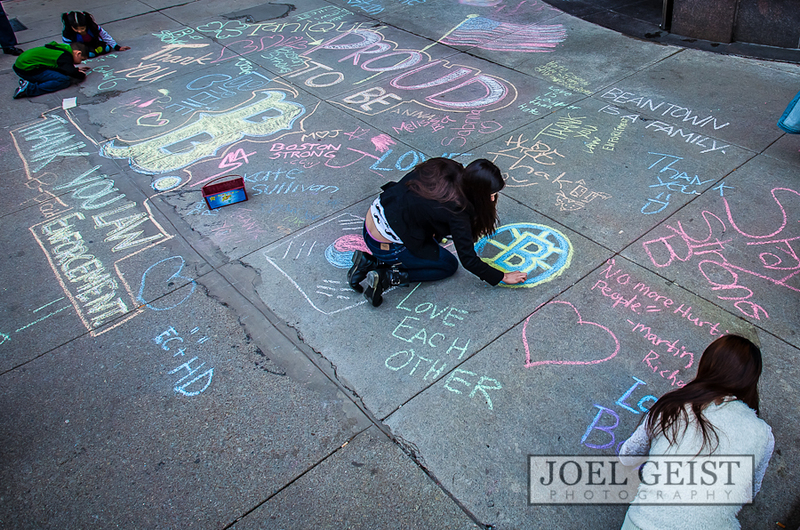 There were multiple locations where people had placed notes, but a local sports store Niketown Boston had placed chalk on their sidewalk for people to leave messages. 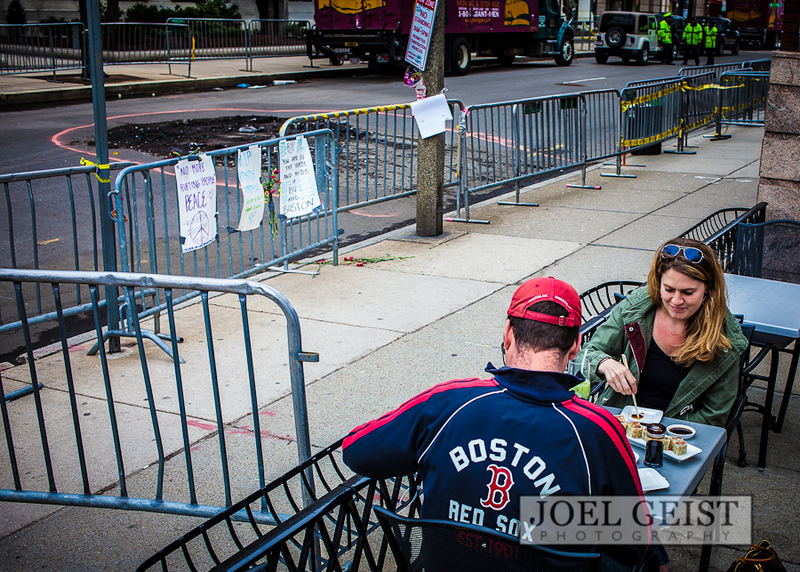 Others looked for places to shop and have lunch these two were having what looked to be a quiet normal lunch at first glance, but if you look in the background you can see the crater where the second bomb was detonated, and signs posted on the barricades. Others just needed to do something to show how happy they were the suspects were arrested and the mayhem was over. 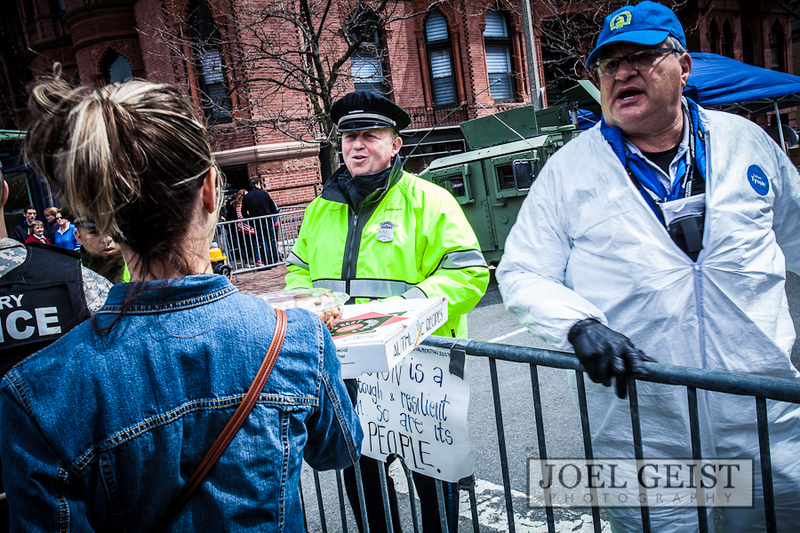 Walking through the city on three occasions I saw people bringing gifts as a way to thank law enforcement and National Guard personal that were dispatched. 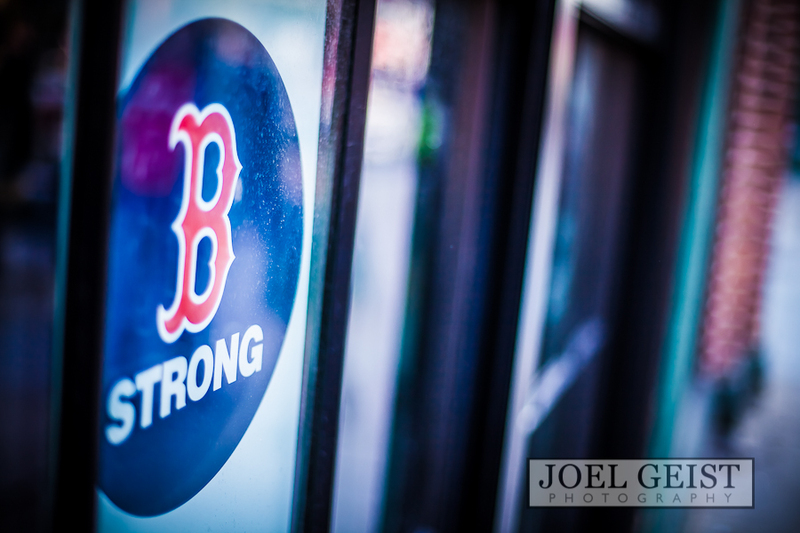 Acts of kindness and gratitude are often overlooked in a large city but nonetheless they are out there if you look for them and one way for Boston to stay strong is to pull together and make them happen more. 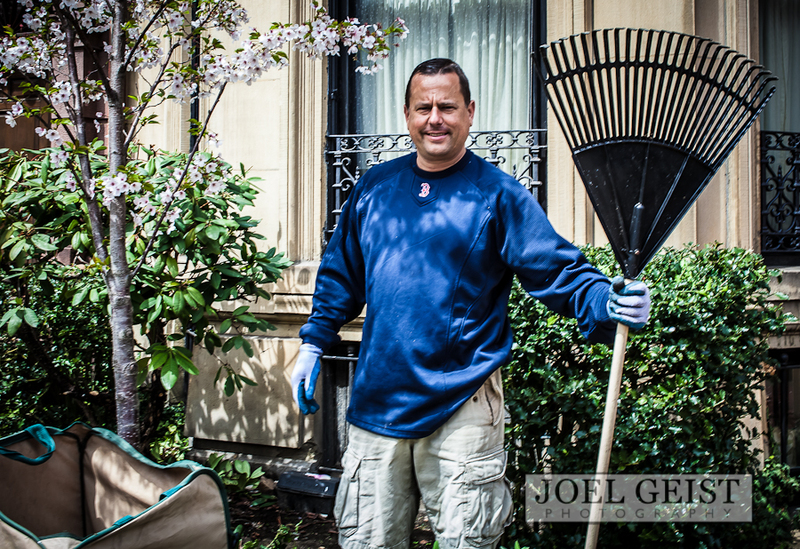 Boston is a proud town and many people take pride in their homes here and I met Jeff who was working on a landscaping project. I stopped and chatted with him for a bit. We talked about his project and the history of the his house that was built for John Quincy Adams family before he became the president. 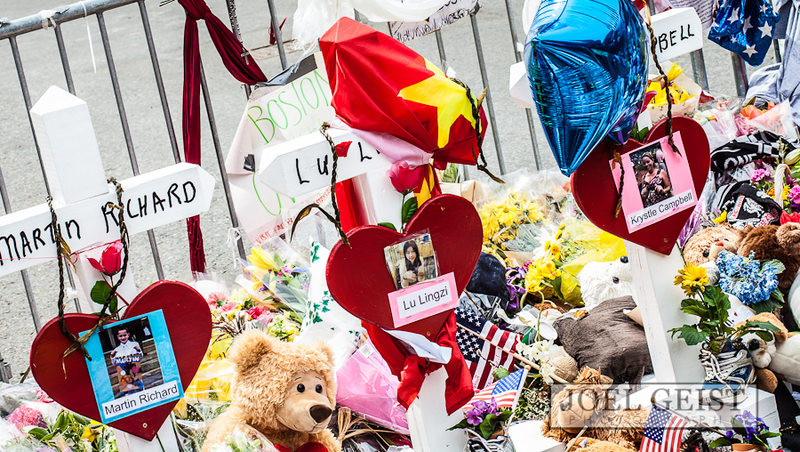 This image is close to the western memorial site where ladder 15 company fire department house has stood in front of every Boston marathon. 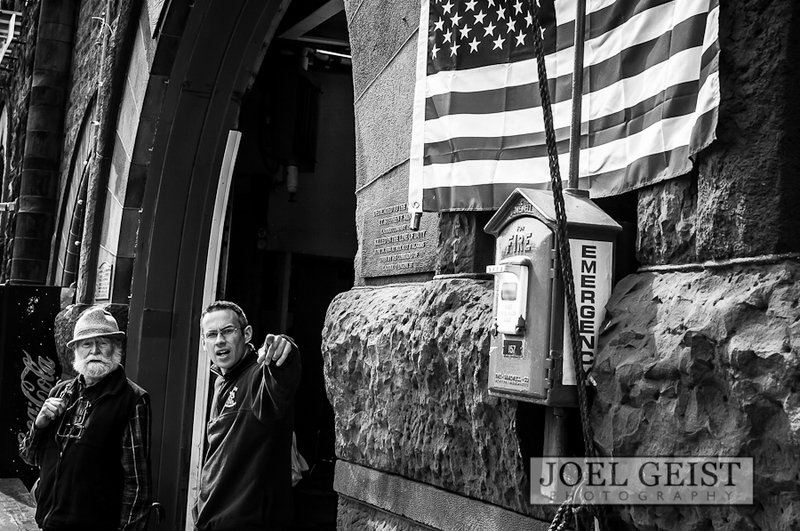 It was built in 1888 and is still in use today and I just felt the look of the older gentleman is as classic Boston as the firehouse he was standing in front of. 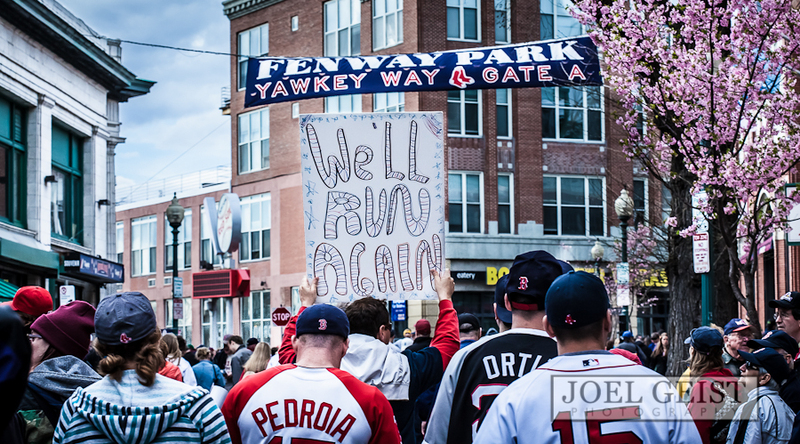 113th running of the Boston marathon was the center of the attack but it is clear the tradition will carry on and next year I foresee more runners than ever. As I walked along the route on the way to another steep tradition. 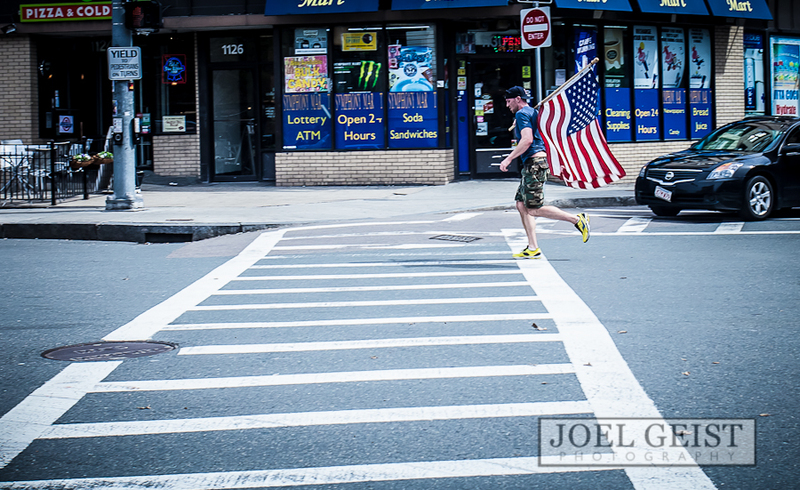 I saw a man running holding the flag running towards the finish and snapped this image of him. 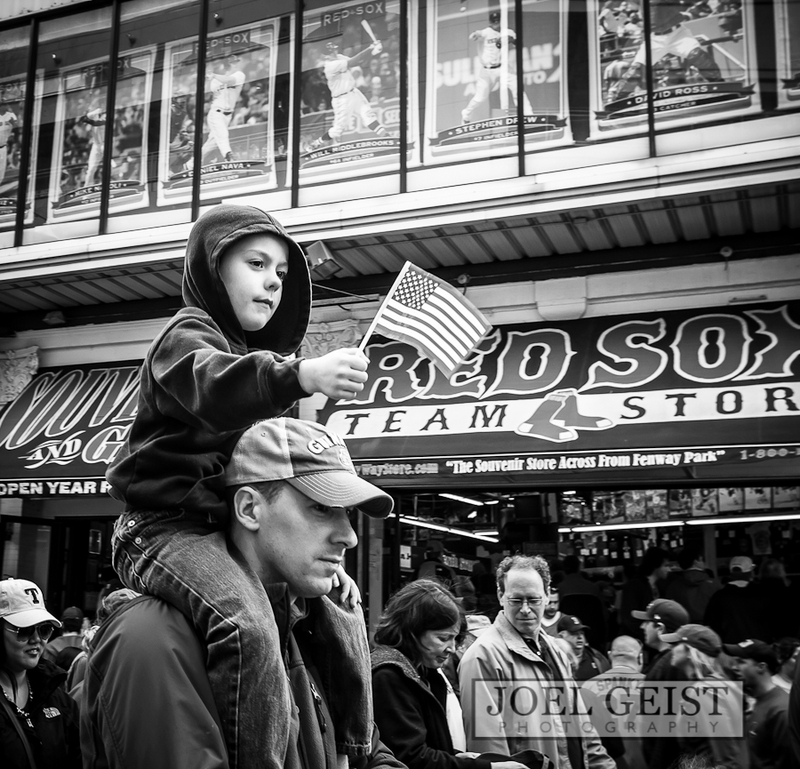 As I walked away I could hear loud cheers as he neared the crowds of the memorial. As I headed further down the course, I heard the cheers in area that have been there in summertime since 1912. 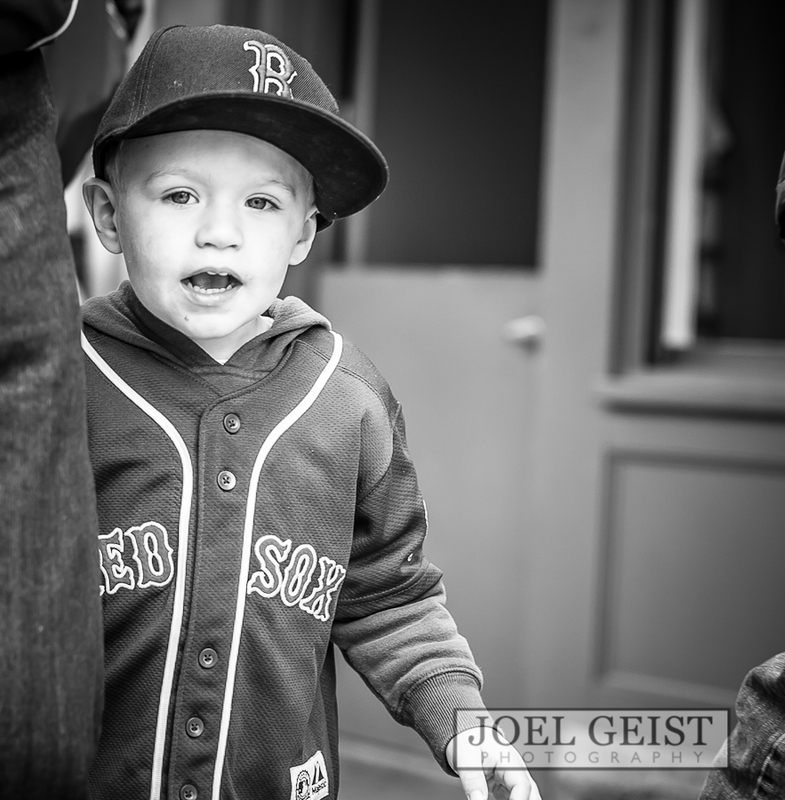 This is Fenway! 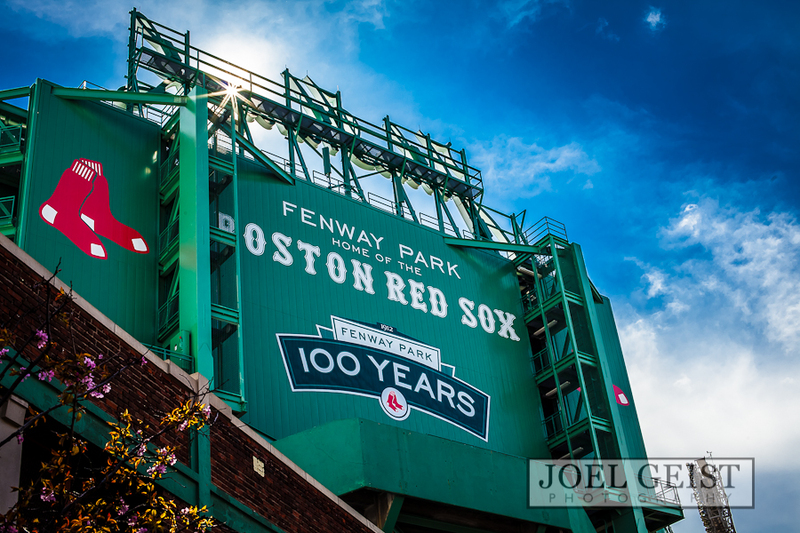 Home of the Green Monstah. The tradition and pride housed in this green cathedral of our American pass time can not be matched. It is the oldest stadium in Major League Baseball and there is a unique feel to the stadium. 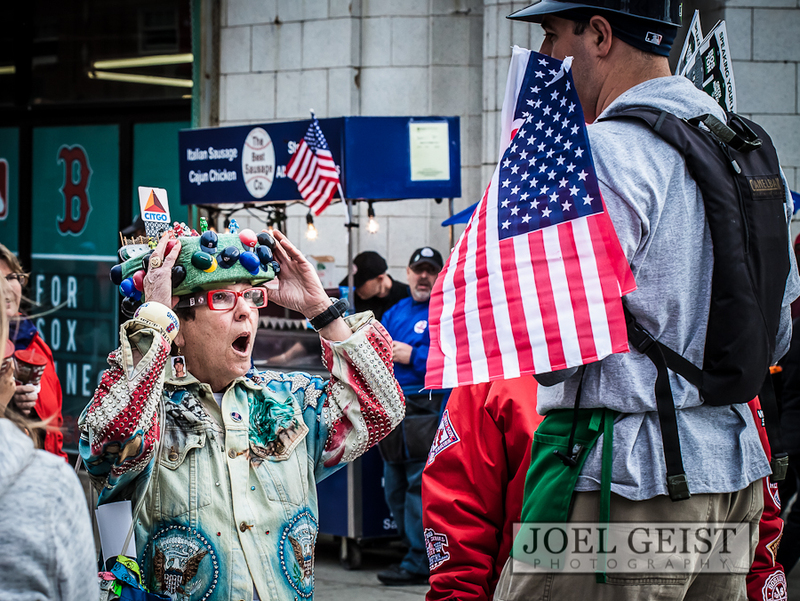 The fans came out in force on the day after the suspects were apprehended to show that this city will not tremble in fear. 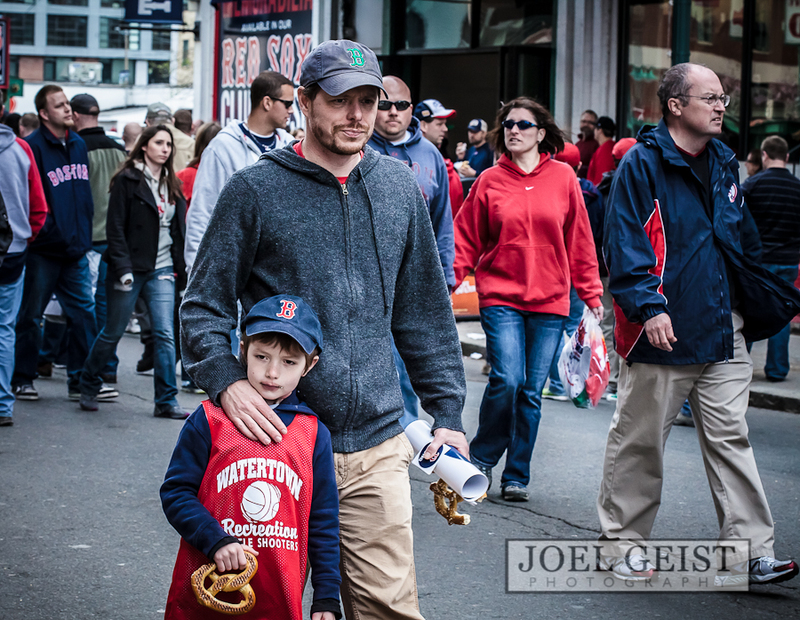 There was an intensity as they beat the Royals and everyone was leaving. 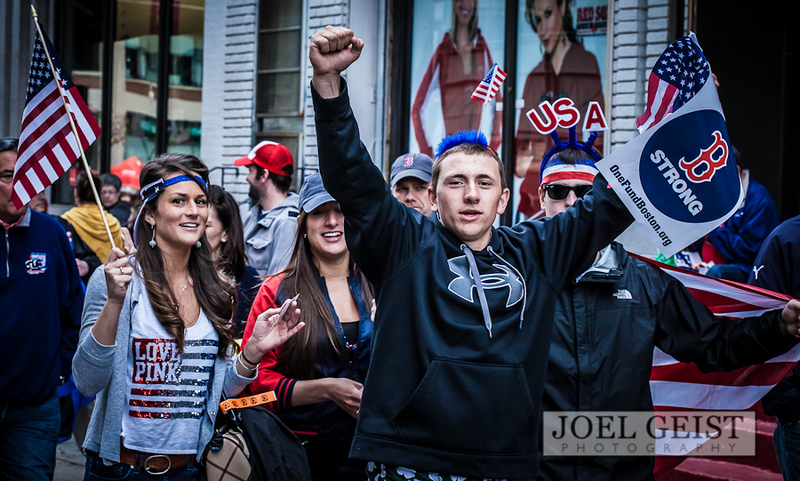 It looked like just as many came as a show of support to the city maybe more than to see the game, they were decked out in full Boston Gear and American flags were abundant in the crowd. 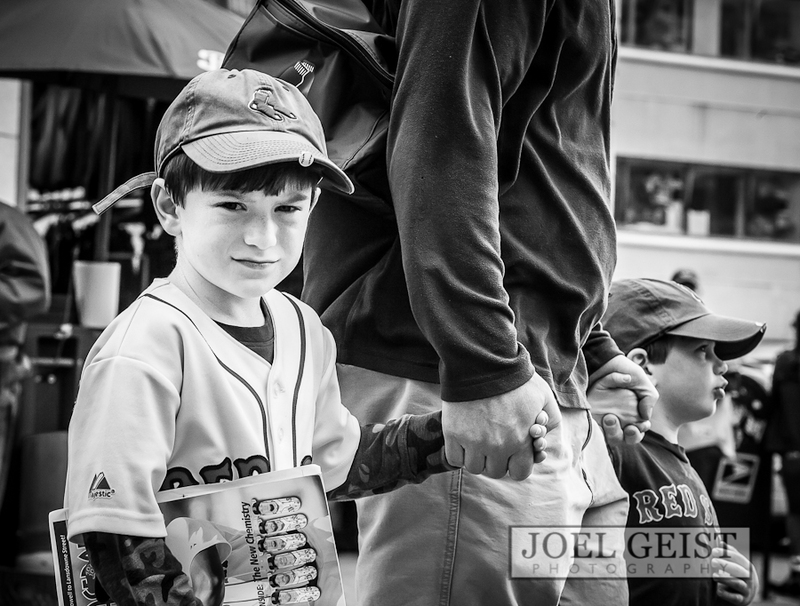 There was a sense of pride some showed but there was also something different in the air, you could feel people were on alert and parents seemed to grip their children’s hands a little tighter. 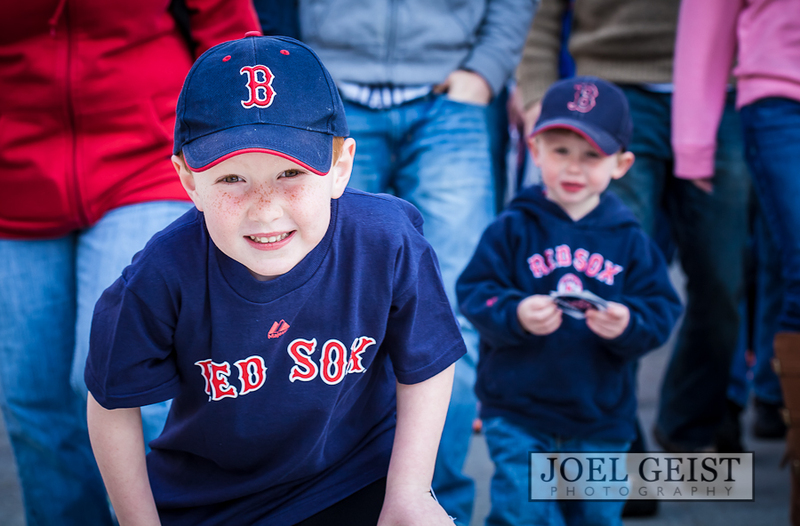 In the end the kids were happy to go to the game, get a win for their Sox and spend a day with their families. 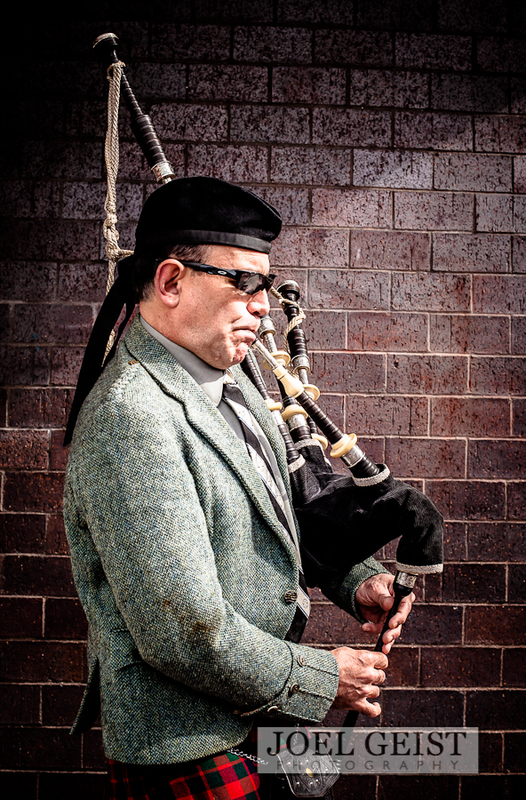 This week will live in the memories of many and the Bagpipe player on the way to the T station was a perfect ending as I was trying to layout my story in my head. His song rained sad somber notes, I was curious if I could do this story justice? Just then the tune changed to a more upbeat music as if to give a sense of hope and reassurance to all passing by and to my question. Everyone had different ways of mourning and bouncing back, mine was to do this piece. Some lives will be changed forever, it may be a tough road and that is why it is important to…. 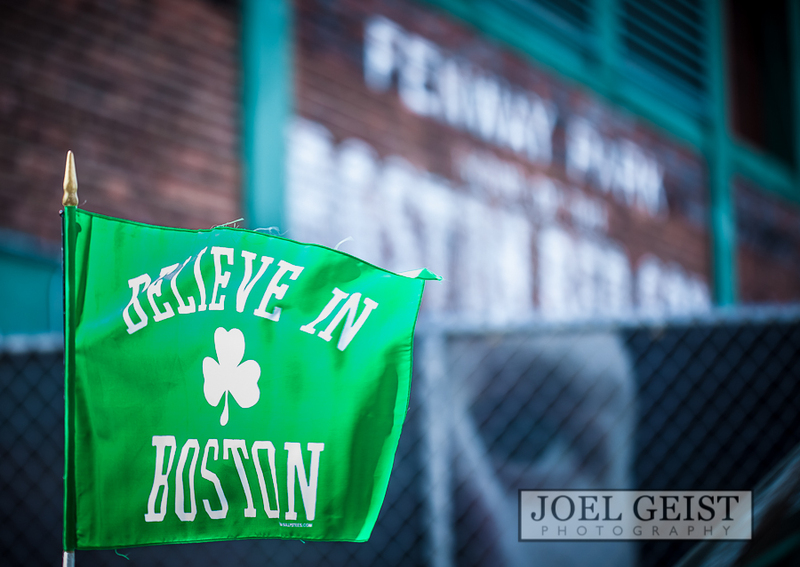 BE STRONG, BELIEVE Boston will get through this and grow stronger as a city, and NEVER FORGET! Hello, I’m a photographer all the way from San Antonio, Texas. This is really great and you can feel the emotion in each image. Thank you for sharing! I’m going to share it with my local photographers group. Hey Natalie, I really appreciate it. Every once and a while you can do something that really means a lot to people. Thank you for coming to my site and taking the time to comment! This is truly amazing. 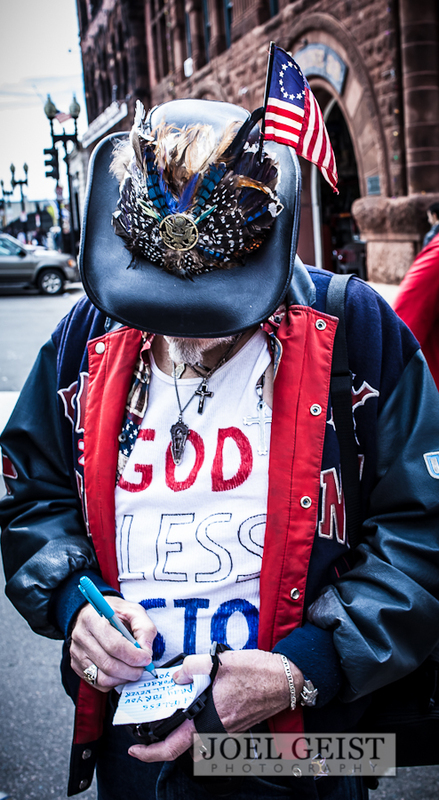 You captured one tough city in recovery, and I think that’s what we need to see. Thank you very much Shalese, I appreciate your kind words and taking the time to comment. 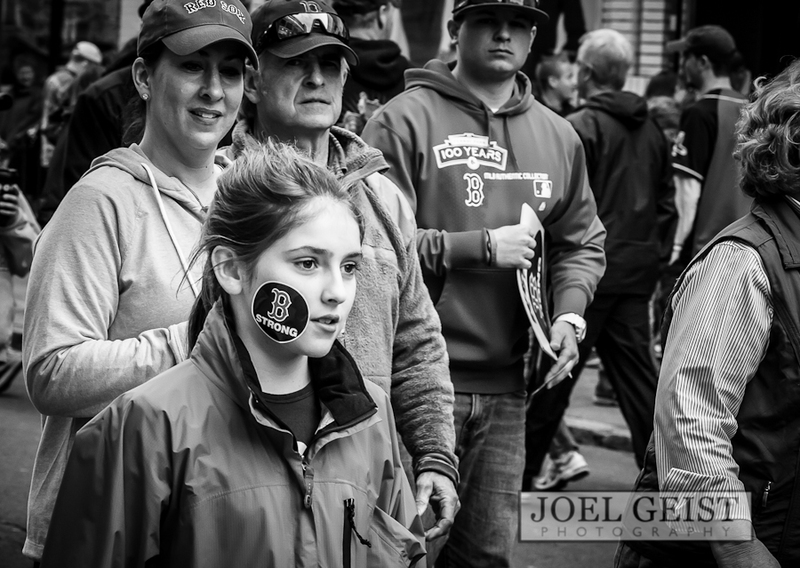 Awesome photos Joel, they really tell the emotional story! Thanks for stopping in, the compliment and taking the time to comment Michael, I really appreciate it. 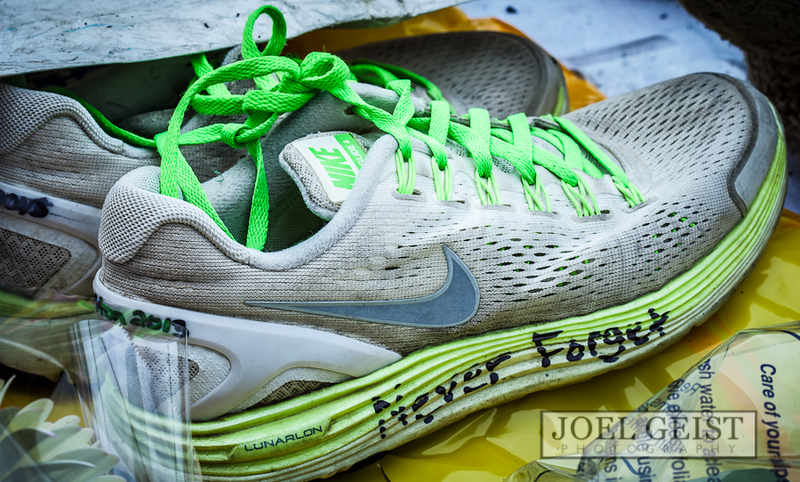 Thank you Joel – Boston will mourn for all of the victims and losses, heal eventually but never forget. I believe that we will also use this tragedy and ensuing acts of heroism as an inspiration to make more of a difference in our communities. 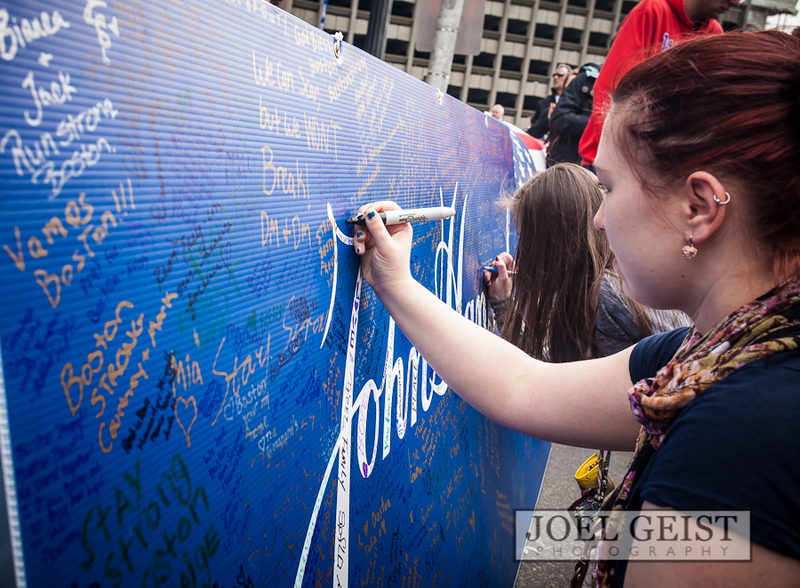 I believe the 2014 marathon and charitable giving will reach a level never before seen. The BAA will have to expand the field; I think more people than ever will want to participate and raise money for charity – whether running, rolling or walking. Thanks Steve, I hope you are right on everything you said! Thank you for taking the time to comment. Thank you for capturing our hearts in your photos. Thanks for stopping in and appreciating them Elizabeth! Awesome photos! Thanks for sharing. Thank You, and thanks for commenting Teresa! 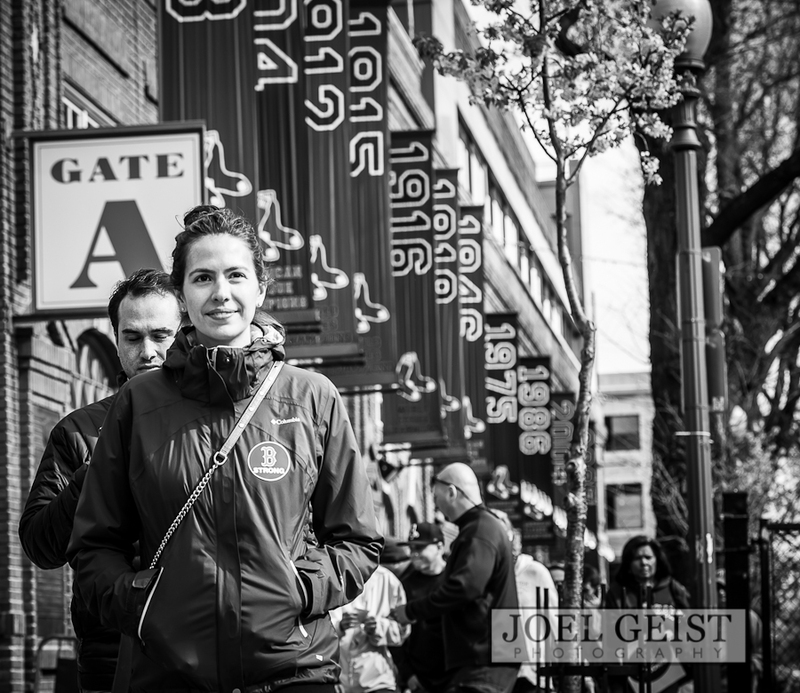 Joel, I have just finished looking at your photos, it felt healing to see the city coming back to life, especially the pictures of the children! 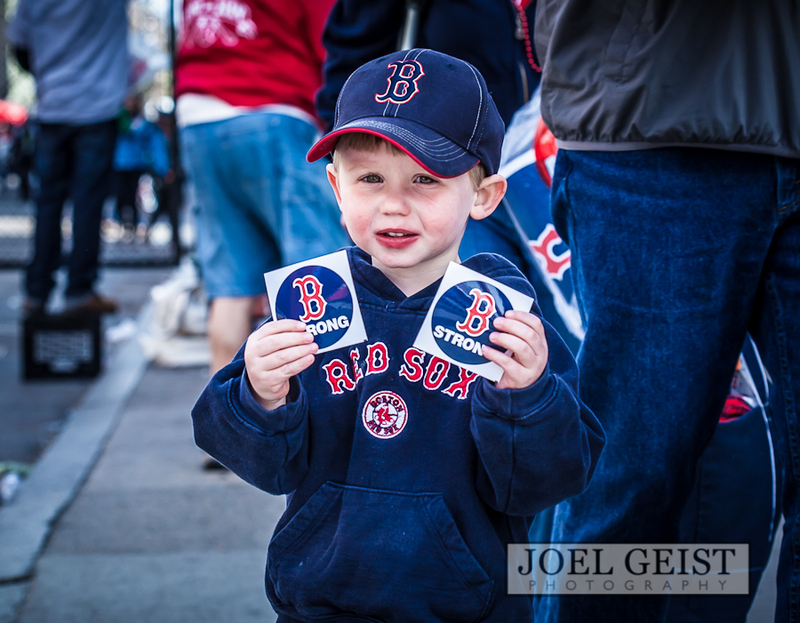 Great job your pictures show the strength of the Boston people! Thanks Mary! Glad you could see them! 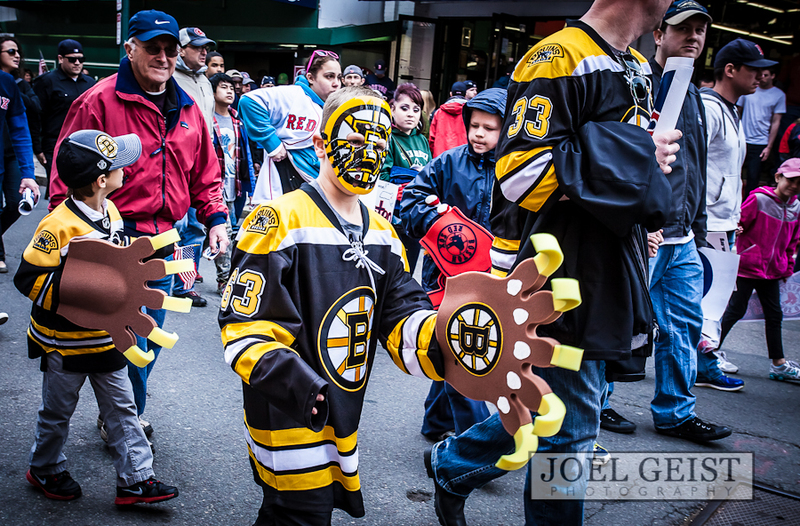 Nice work Joel. Some really moving photos. Both touching and inspiring. Thanks Lori, for the compliments and taking the time to stop in and comment. 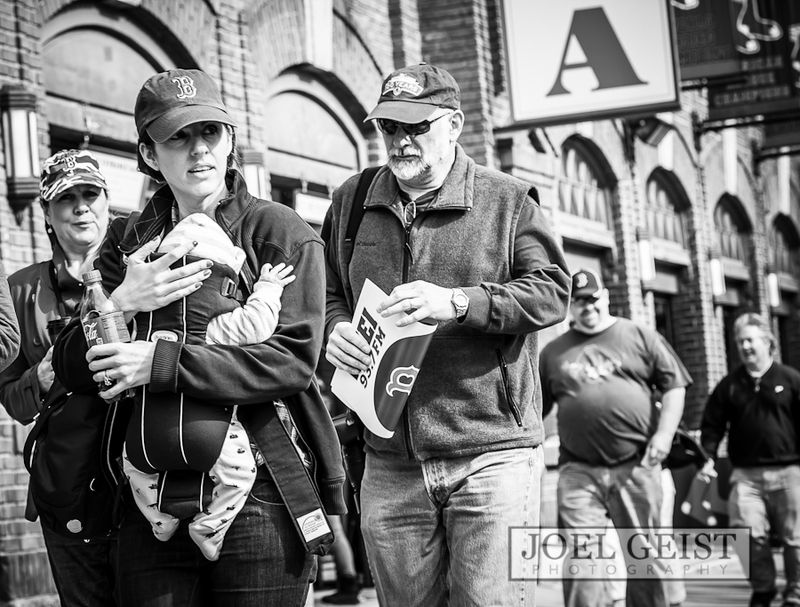 Your photos capture so much emotion and tell a simple yet profound story of tragedy and triumph! Thank you very much Suzanne. Thanks for taking the time to comment and check out my site. Great job Joel!! I love the images but more importantly the emotions you captured.. Incredible images! I really sensed the love and resilience of our great city. Thanks for sharing this story. Your Welcome Janice! Thank you very much for your kind words! This photographic series meant a lot to me. I put a lot of effort into it and getting the word out so people would see it. I am just glad it is getting out there, I hope it may help us be strong in the future but never forget the lives of those impacted by this terrible tragedy. Thank you Jamie! The hope is always they can stand alone. It’s been a long road from the railroad bridge shoot in Bismarck years ago 🙂 Thanks for checking out my site and taking the time to comment. I hope all is well for you and your family! Thanks for visiting and taking the time to comment, glad to hear it resonates with you. Thanks I hope I can make it this month. Beautiful pictures. They tell the story all on their own with no need for words, something only a true photographer can accomplish. Wonderful job. Thank you so much Angela! I appreciate your compliment, taking the time to read and comment. What a wonderful story. You have an unbelievable gift as a photographer. I have shared this with my friends. Hope to see you at the next meetup. Thank you Art! I appreciate the compliment, and the share. You guys are a great bunch hope to see all of you soon.